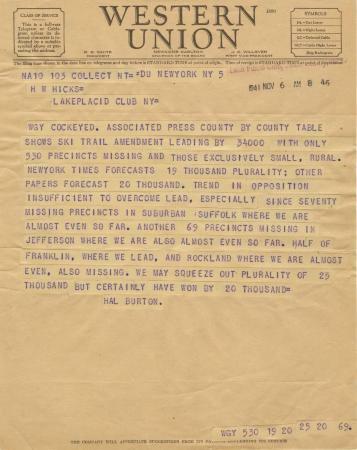 Telegram from Hal Burton to Henry W. Hicks, chairman of the Whiteface Area Ski Council, regarding the vote on the Ski Trail Amendment and the probability of it passing. The amendment was passed. Source: Adirondack Museum Library, Harry Wade Hicks papers, MS 63-270, box 1, folder 10.